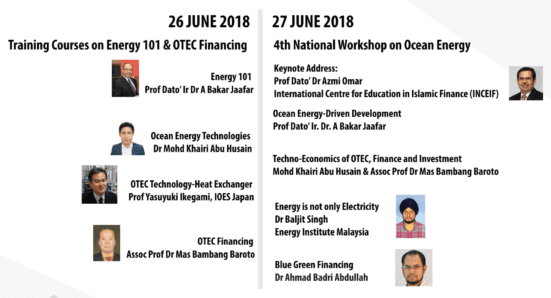 This year, the focus of our workshop is on the Financing of Ocean Energy in Malaysia. We will be discussing the technical readiness of the ocean energy implementation in Malaysia and the Financing selection available in Malaysia to undertake Ocean Energy Projects. The event will be held in Dewan Seminar, Universiti Teknologi Malaysia, Kuala Lumpur. We believe that your participation in this workshop is of utmost importance.